This one came with some mixed expectations. On the one hand, my track record with military science fiction is pretty much non-existent, so I really had no idea what I was getting myself in for. That's just a little bit scary. On the other hand, I'd heard almost nothing but praise for it, so at the very least I was starting with some of the most highly regarded military science fiction. My reaction at the end is pretty mixed too. 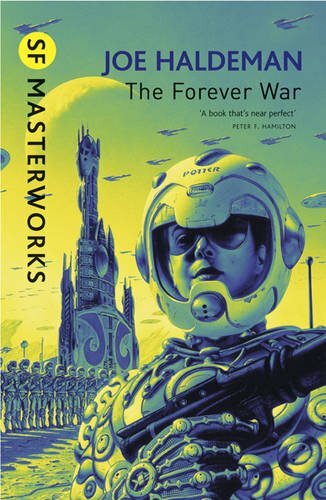 The Forever War follows William Mandella, a physics student in the halcyon days of 1996, who gets recruited into a war against an alien enemy, the Taurans, after an exploration ship is destroyed in deep space. The catch is that every time they travel to a new world to defend, their rate of time gets increasingly disparate from that of Earth's. When Mandella returns to the planet after what seems to him like two years, it has actually been over two decades; this time dilation only gets worse the longer he stays in space, with each new batch of recruits or civilians that he meets only seeming more and more alien in comparison to the time that he came from. So, the good bits. First, it managed to make physics at least passably interesting, which is always a feat for me. And you really need to have at least a passing interest in that area of science for The Forever War to have any appeal whatsoever, considering that the main concept is hinged on it. Second, the combat scenes are fantastically written, with just the right balance of excitement and overwhelming sense of futility. They are utterly brutal, for varying different reasons each time, and Mandella is basically just thrown in at the deep end and praying for the best outcome each time. If you're more interested in the military aspect of the genre, I'd definitely recommend this. The main character is largely well-written too, likeable enough that the audience sympathises with his conflicting desires for the war to end and to not face what Earth has become, but detached enough that his survival makes sense. So far so good, right? That's where my modern, liberal sensibilities come in to make things thoroughly uncomfortable for me. I didn't think that the sexual politics were written in a great way, which is why I hated how unavoidable it became as the book progressed. Okay, so minor spoiler here: when Mandella goes back to Earth, he finds that after a population boom that has taxed resources, the world's government is encouraging people to partake in homosexuality. Mandella is not comfortable with this, so when this element of society becomes more and more prevalent, it kind of feels like the book is making the point of "homosexuality = big, bad future". Add to that the implication that we will get to the point where sexual preferences can just be turned on and off? It's just all kinds of homogenous, stereotyped and uncomfortable. I know it was written in 1974, but come on. It's a book about a war in space. At what point would I have cared what the majority of the population's sexual preferences were? At what point would I have assumed that it was any different from the varied spread that we are currently aware of? It's a weird opposition between gay and straight, and I'm sure the world-building would have done fine without it. It may not bother other people anywhere near as much, but sexual politics is a subject that is close to my heart and cannot be messed with.